The baby's giving me that "What do you want?" look. The owl blinking. It's funny to see their eyelids. Now that the time has changed, I was able to get out after work and stop by one of my favorite parks close by work. I saw the big owl sitting high up in the tree from pretty far away. I walked by the old nest from last year and wasn't sure what I'd find. Yea, there was a baby owl sitting in it looking right at me. It's only a couple of weeks old. I'm going to try and get there every week to track it's progress growing up. They grow up fast and then leave for up north before the summer. I was on my way from Gatorland in Orlando to Circle B Bar Reserve this past weekend and noticed this big landfill sitting on the side of the road I was traveling on. There were so many birds sitting on top of the trash pile that I had to stop and take a picture. Pretty sight isn't it? I did notice when I got home and zoomed in on the pictures there was an eagle sitting on top of the pile. I guess one man's trash is another bird's treasure! It all starts here. Two egrets getting frisky in the bushes. Mom with her back to me with 3 babies. A set of parents admiring their 2 babies. Another mom feeding her 2 babies. I had a Flickr meetup this past Saturday at Gatorland in Orlando. It was perfect timing as the great egrets were having babies. The bird rookery there was full of wild birds mating and laying eggs. There were several nests that already had babies on them. These babies will fledge and take off in around 6-7 weeks. It's funny how their beaks seem to grow first. It seem bigger than the rest of their body. There were tricolored herons there starting to mate so I'll have to go back in another month. 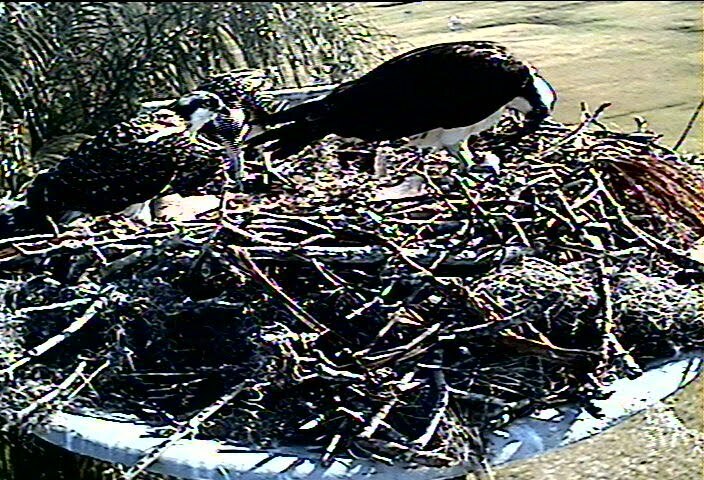 The 2 osprey babies in Dunedin that are on the nest with a web cam are getting big. They will be flying off some time in early April. It's amazing how fast these birds grow up. 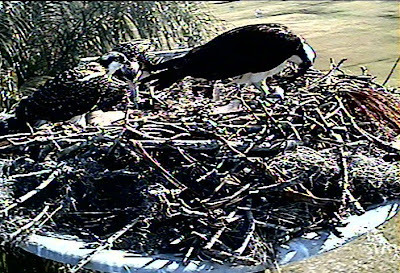 You can really see them now on the nest since they have grown in the last week. The above picture is from the web cam. The 2 babies are on the left with Mom on the right. You should check out the site before they are gone. A baby zebra was born on St. Patrick's day at Lowry Park zoo. Above is a video from the zoo of the baby zebra taking it's first steps and below is the official press release from the zoo with a great picture. Hopefully in the next couple of weekends I will be able to get there to get some pictures. Black swan sitting on her nest, up against a fence. Her egg. She was walking around the nest. She has a nice big nest. Swan sitting on her nest. Not sure if these are abandoned eggs. There were eggs everywhere. Another black swan on a nest under a bush. Ibis were walking all around her. This goose had just laid this egg. She stared at it and then plopped down and sat on it. Nesting season is in full swing at Lake Morton in Lakeland. There were several swans and geese with nests. I noticed several eggs just laying on the ground out in the open without any swans or geese near them. I'm not sure if they sometimes lay eggs and then abandon them. I've read that the eggs take anywhere from 30-45 days before they hatch. That's a long time for a goose to guard an egg out in the open at the lake. A couple of the swan nests had 2 swans on it so both parents seemed to be pitching in. I'm going to try and go back in a couple of weeks to see if there are any chicks running around. Classic "swan a swimming" pose. I couldn't get seven to swim in a row. Grey morph of a black swan. Hanging with all of his friends. This swan had one of his feet growing out of his back. He was only paddling with his right foot. I never saw him out of the water. This "feeder" came fully prepared with her rubber gloves and bags of bread. I had always heard of the famous swans that live in the big lake in downtown Lakeland. I finally made it over there this weekend. My husband had some business near there on Saturday morning so I rode over with him and headed to the lake while he was working. At first I just saw a few swans and thought "This is cool". I parked and got out and started taking pictures. Then I noticed across the lake (across the street from the Chamber of Commerce) there was a huge flock of them hanging around. There were also plenty of ibis, egrets, ducks and geese hanging around as well. The swans were friendly but not overly aggressive. The geese are the ones to watch out for. They will chase you down if they think you have food. I was leaning on a tree away from the fowl crowd with my eye to the camera focusing on the ducks in the water when I felt this bang, bang, bang on my tennis shoe. I looked down and this goose was banging on my shoe wanting to be fed. If you go there to walk around in the grass be careful where you walk. All that feeding produces a lot of fowl poop. More on "swan lake" coming in later posts. American wigeon. He has a pretty blue bill that is outlined in black. Your basic mallard. They really are pretty with their yellow beak, bright green head and orange feet. This female mallard is very friendly, walking around on the sidewalk getting very close to people. Beautiful purple feathers are outlined in white. These are present in both the male and female mallards. Black bellied whistling ducks have light pink beaks and bright pink feet. It's pretty in contrast to the black and brown body. Male ruddy duck. He also has a pretty blue bill. I used to think all ducks looked alike. They all quacked and paddled around on top of the water. In the past year I have been learning about all of the different ducks and their distinguishing features. I noticed on a recent trip to the zoo how many different ducks were at the zoo and how different they all looked. They all had different beautiful features. An important note - not all ducks quack, there are some ducks that whistle when they are flying. Picture I took of Spirit this past summer taken through the fence. I recently came across this article on Tampabay.com about how the permanently injured eagle, Spirit, had died at Boyd Hill. She was 27 years old and had been a resident at Boyd Hill since 2001. When Spirit was young she was bitten by a rattlesnake which had done permanent damage to her wing making her flightless. She had a great big roomy cage at Boyd Hill and I was glad I got to see her while she was there. Below is the article about her life. Below are some of the other residents there.